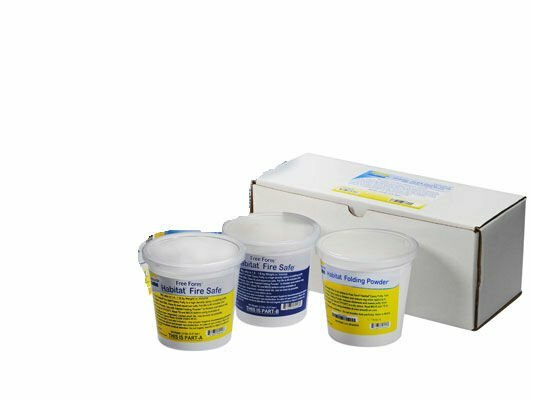 Free Form Habitat Fire Safe epoxy putty is a high density epoxy sculpting putty that is flame rated (E84, Class A). Habitat® Fire Safe is solvent-free and contains no VOCs. Working time is 90 minutes and cure time is 16 hours at room temperature (73°F/23°C). Epoxy cures to a very hard, flame and heat resistant material that is easily painted. Fire Safe does not contain any carcinogens (cancer causing agents). Free Form Habitat Fire Safe is suitable for interior and exterior theming applications and general sculpting. It is also certified 'aquarium safe' and is used by aquariums and zoos to make hyper-realistic trees, vines, rocks, coral and other display elements. Use with Habitat Folding Powder – fold powder into epoxy putty to thicken and reduce sag when applied to a vertical surface. Folding Powder also reduces stickiness and makes the epoxy more handle-able. Once putty is applied, it can be stamped with a silicone rubber stamp to create repeating patterns with intricate detail over a large surface area. Surface can be smoothed with alcohol or water. New Habitat Fire Safe will bond to cured Habitat Fire Safe without delamination. 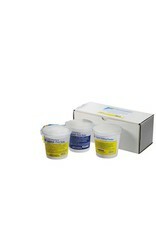 Habitat Fire Safe will not melt foam, and can be used as an EPS foam coating. Free Form Habitat Fire Safe is also an excellent repair cement and bonds permanently to itself, PVC, acrylic sheeting, wood, many metals, plastics and foams.